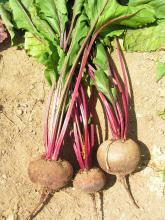 The beetroot is a plant which originally came from the shores of the Mediterranean. Etymologically, the word comes from “beta vulgaris” (chard), which is from the same species even though they do not look alike, and “root”, meaning a plant grown for its edible root. Every part of the beetroot is edible, including the leaves, but it is indeed mostly grown for its root. While the red beet has a slightly sweet taste, it should not be mistaken for the sugar beet, of a white colour, which is exclusively grown for sugar production. There are basically two kinds of red beet: the long beet and the round beet, the latter being the most consumed of them by far. The red beet and the Loiret: a 50-year tradition! In the Loiret, red beet production started developing after WWII in the sandy soil of the Val de Loire which it is particularly fond of. If one were to name a red beet capital, it would unquestionably be Saint Benoît sur Loire, a small town on the banks of the Loire River located about thirty kilometres east of Orleans. At first, a group of farmers invested in an oven specifically intended for cooking red beets, and then selling them in the markets. As time went by, those cooking workshops turned into real small businesses, all the while retaining their strong ties with the local terroir and farming community. Those industrial facilities are called “processing companies”, in relation to red beet processing which simply adds up to the steam-cooking of beets. Then in some cases vinegar is added. And that’s it! No supplements and no preservatives are added! 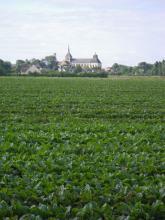 For the past 50 years, Loiret farmers and processing companies have developed a widely acknowledged know-how and quality, raising the department’s sector to the nation’s top ranks: the 40 producers in the Loiret grow close to 50% of France’s red beet production, and the 5 processing companies deliver close to two-thirds of processed beets. The full production period stretches from August to October. During that time of year, your local shop will be selling “new harvest” beets, in the same way as you can buy new potatoes. Thanks to the Loiret producers’ know-how, it is possible to also store beets during the wintertime and until the following spring, while preserving their taste and nutritional features. In this way, the processing companies are supplied year round, so you can enjoy beets in all seasons! About forty producers who grow about 1,000 hectares of red beets, representing close to 50% of France’s entire production. 5 commercial brands: ALLAIRE, BABY SOPA, BTG, ROCAL and TERR’LOIRE.